Don, the host of "Total Drama: The Ridonculous Race". Don is such an awesome character. He is nice, fair, and always ensures that none of the contestants are cheating. If he was so great, why didn't he host "Total Drama" from the beginning? After two disastrous seasons of "Total Drama" known as "All Stars" and "Pahkitew Island", where Chris crossed the line for causing a rift between two couples, the show decided it was time to hire a new host to see how the show goes without Chris. The best thing about Don's time as host was that his performance was mixed to positive. 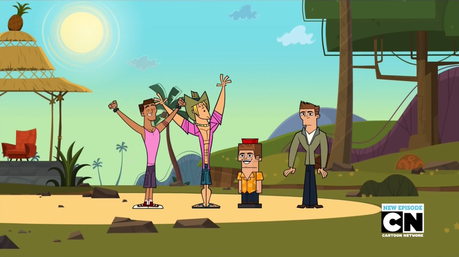 Some people wished that Chris was made the host of TDRR, while others believe that the race managed to restore "Total Drama's" glory. Do you know who likes Don? Almost all of the 84 contestants in the show. Most of Chris' former contestants would rather have Don as THEIR host instead of Chris. Do you know who hates Don? Chris McLean. He is jealous that he was not made the host of TDRR, even though most of the fandom felt repulsed at what Chris did in the "All Stars" and "Pahkitew Island" finales. Screw Chris McLean and screw the Ice Dancers named Jacques and Josee. Topher, Geoff, Bridgette, Josh, and Don are so many times better than Chris McLean.